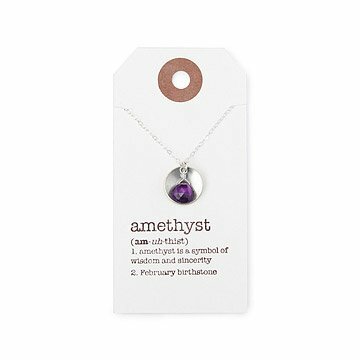 With Britta Ambauen's birthstone necklace, you can familiarize yourself with your stone's unique meaning. Did you know that the gemstones we associate with our birthmonths were also believed by the mystics to carry special meanings and even supernatural powers? With Britta Ambauen's modern interpretation of these ancient stones, you can familiarize yourself with your birthstone's unique characteristics, or give the gift of knowledge and beauty to a special someone. For example, January's stone, the garnet, is recognized as a symbol of protection and prosperity. Each birthstone is cradled by a tender half-moon of sterling silver that is etched with the characteristic on the back. Handmade in Seattle, Washington. Click here to see all months. Gently rub the silver component with a jewelry polishing cloth to remove tarnish and dirt. For extra cleaning power, soak in a jewelry cleaning solution. If you are looking for a birthstone portraying jewelry item, look no further. With style and elegance, the necklaces shine of the beauty within ones month. I haven't given her the gift yet. I am concerned about the strength/durability of the chain. I hope it holds up! Had to purchase additional chain. The one included was tangled at the clasp to flimsy, didn't want my daughter to lose the birthstone. It was even prettier in person! I bought it for my sister, who can be difficult to shop for. She loved it! The gift was beautiful but the gift message I requested was for another person completely. We had a good laugh about it. I hope the recipient that received our message enjoyed it. Glad the gift was right. The product is very unique to me. It is understated yet beautiful.